PPT horizontal flow 3 stages1 PowerPoint Templates-Our Awesome Diagram consists of a design of arrow showing step by step Execution. This image identifies the concept of stages in process. This attractive image makes your presentations professional and interactive. Deliver amazing presentations to mesmerize your audience.-PPT horizontal flow 3 stages1 PowerPoint Templates-Horizontal Flow, Abstract, Arrow, Blank, Business, Chart, Circular, Circulation, Concept, Conceptual, Design, Diagram, Executive, Icon, Idea, Illustration, Management, Model, Numbers, Organization, Procedure, Process, Progression, Resource, Sequence, Sequential, Stages, Steps, Strategy Approaching the dais can make you anxious. Experience the calmness our Ppt Horizontal Flow 3 Stages1 PowerPoint Templates bring. 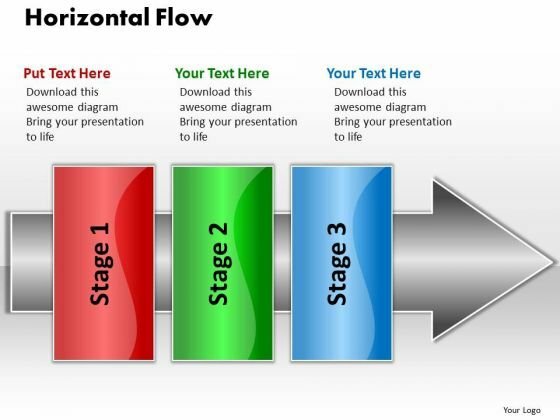 Our Ppt Horizontal Flow 3 Stages1 PowerPoint Templates have a distinguished appearance. They also project a balanced approach.